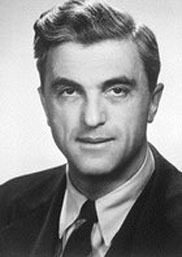 Swiss-American physicist Felix Bloch studied under a virtual Who's Who of early 20th century European science, including Niels Bohr, Peter Debye, Werner Heisenberg, and Erwin Schrödinger. In 1928 he developed the Bloch-Fouquet theorem, which deals with "Bloch state" or "Bloch wave" functions for electrons in a crystal, used by physicists to study the nature of metals. In 1932 he introduced the Bethe-Bloch expression, which explains how charged particles in matter slow down. By his mid-20s he was already among the world's leading physicists and taught in Germany, but he was Jewish by heredity and faith, so he wisely fled shortly after Adolf Hitler rose to power. He settled at Stanford University, where he spent the bulk of his career. In 1934, with his colleague Luis W. Alvarez, he proposed a proof of the magnetic moment (spin and magnetic characteristics) of free neutrons. In 1939 Bloch and Alvarez successfully measured the neutron's magnetic moment, and in the same year he became a United States citizen. With the advent of World War II he made crucial contributions to the Manhattan Project, researching uranium isotopes as part of the American effort to create atomic weapons. He also conducted counter-radar research during the latter years of the war, and made noteworthy contributions to the scientific understanding of superconductivity. After returning to Stanford at the war's conclusion, Bloch conducted the work for which he is best known, developing nuclear magnetic resonance (NMR) in 1946. Now used in advanced chemistry and for medical diagnosis, NMR is a technique which exploits the magnetic property of a nucleus to allow the spectroscopic detection of structural information of molecules. For this work, Bloch was awarded the Nobel Prize for Physics in 1952, sharing the honor with Harvard physicist E. M. Purcell, whose concurrent but independent experiments reached nearly identical conclusions. In 1954 he became the first Director-General of the European Organization for Nuclear Research (CERN)'s High-Energy Physics Laboratory in Geneva. His wife, Lore Misch, was also a nuclear physicist and refugee from Germany; they met at a physics conference in New York. After his retirement they returned to his native Zurich, where he died in 1983.